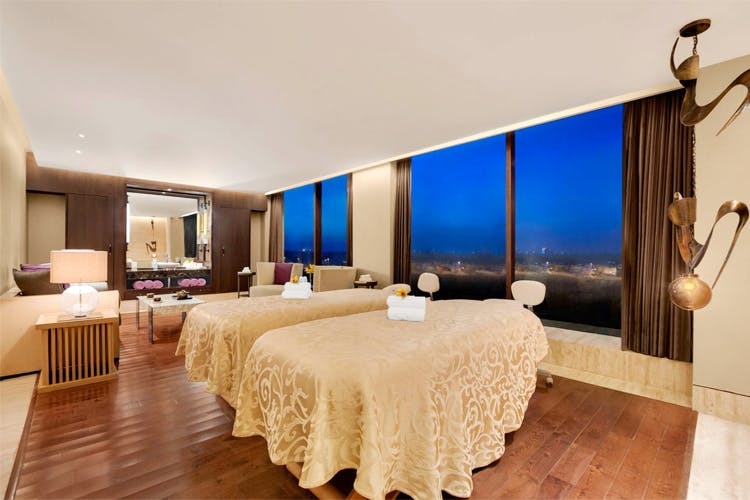 ESPA at The Leela Palace is a luxury spa facility spread over two floors that includes a state-of-the-art fitness studio, relaxation lounges, a cafe, heated benches, and full-service spa suites. It’s important we treat ourselves once in a while – and there’s no better way to do it than a massage. If you’re already a big-time massage junkie, ESPA is definitely one for the books. This spa’s natural wood interiors, hard-carved stone furnishings, and soft fabrics make it a place that sounds like the kind of luxurious heaven you’d never want to leave (well, it actually is that place). They do spa treatments—their Kizhiswedana Synchronized Ritual being one of their best ones, as well as holistic treatments like deep-muscle massages, radiance facials, detox treatments, and more. Apart from the physical treatments, they even have a special spa menu with organic meals (which are both dairy and gluten-free) that are low on sugar and rich with antioxidants—your body’s definitely going to thank you. They even have a fitness studio and a swimming pool (which looks stunning). The best part is that they’ve also got some offers to make the deal sweeter, so make sure you check those out. Head to ESPA in The Leela Palace for the ultimate spa session, a cool swim and healthy, organic meals. Check out all their services here.